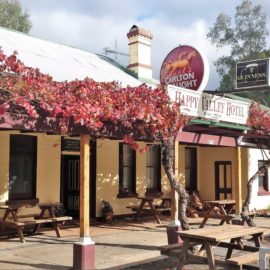 A popular stop-over for travellers for almost 150 years, Ovens still boasts its landmark hotel of 1854, a great base for cyclist enthusiasts or for families traveling along the Murray to Mountains Rail Trail. Yarn with the locals over a leisurely drink in the beer garden or get stuck into a counter meal at the warm and welcoming Happy Valley Hotel, established in 1854. 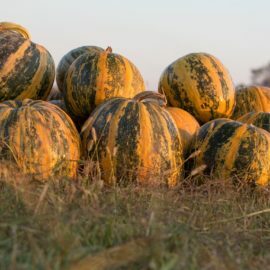 Head across the road to Australia’s first pumpkin seed producer and sample locally grown seeds and delicious 100 percent cold pressed pumpkin seed oil. Turnoff from the Great Alpine Road at Ovens on to the C534 route through the gorgeous Happy Valley to Mount Beauty and Falls Creek via Rosewhite. For another great touring loop follow along the Happy Valley Road (C534) and the Kiewa Valley Highway to Mount Beauty. Return over the Tawonga Gap via Bright and Eurobin. This lovely part of the world boasts picturesque scenery, locally produced wines, lavender, oils and olives. Enjoy an icy cold beverage at the Happy ValleyHotel happyvalleyhotel.com.au. Watch pumpkin seed oil being pressed at the Australian Pumpkin Seed Company pumpkinseed.net.au.  Taste handcrafted olive oils at Homestead Estate Olive Grove & Winery.